One of the Windsor-Essex region’s most popular restaurants has taken a step toward also becoming its greenest. 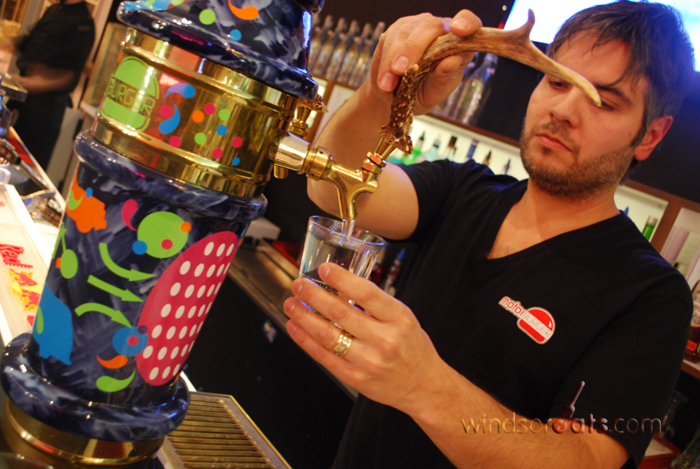 Motor Burger, located in Windsor’s Via Italia, has eliminated bottled water from their restaurant. But this isn’t just your run-of-the-mill tap water. That nice tasting water is from a $4000 reverse osmosis system installed in the restaurant in December 2010 and poured through a tower, similar to a beer tap, that serves both regular and sparkling water. A friend suggested putting antlers as the pour handles and the idea stuck. Motor Burger has also stepped up their brand marketing for their water. Instead of simply labelling it carbonated or sparkling water, Gino and business partner Jay Souilliere have named theirs Fizzy Water. Both the natural and Fizzy Water come in specially designed bottles. The whole system isn’t just easy on the eyes, it’s also easy on the palate. The water is clean, odourless, crisp and cold. Very cold. Customers are loving the new system. Surprisingly, the higher quality water has customers going through less of it, which Motor Burger sees as a good thing. Motor Burger has made a name for itself for its unique atmosphere and great burgers so it`s no surprise that they are now taking an innovative idea and leading the pack. According to the research Gino was able to put together, they believe they are the first restaurant in Ontario on the western side of Toronto doing this. He also doesn’t believe there is anyone in Michigan with this type of system.